Apple supports two styles of two-factor authentication, that they call (and distinguish as) “two-step” vs “two-factor”. “Two-step” is their older method, though functionally they’re basically equivalent. If you have multiple accounts on a Family Sharing arrangement, and some use “two-factor” while others use “two-step”, you’re in for a bag of hurt. For example, any time you change the password on any of the non-master accounts, you’ll have to reauthorise all devices on that account with the master purchaser. You’ll be prompted, when trying to download apps or purchase anything etc, with a dialog saying “Your Family Organizer, [foo], must enter the security code for their payment method”, asking for some kind of input. There is literally nothing you can enter there that will make it work. Not the password for any of the relevant Apple IDs, not any security codes for any credit cards, nada. That “Get Verification Code” “button” is what you’re looking for. As you can see, it simply doesn’t exist with “two-step” authentication enabled. The only solution – to allow your family members to download apps, purchase music / videos / books / etc, or pretty much do anything else on their iDevices – is to force the master account over to “two-factor” authentication. To do this, you have to go to https://appleid.apple.com/ and turn off “two-step” authentication (which will require you to complete some stupid ‘security’ questions). 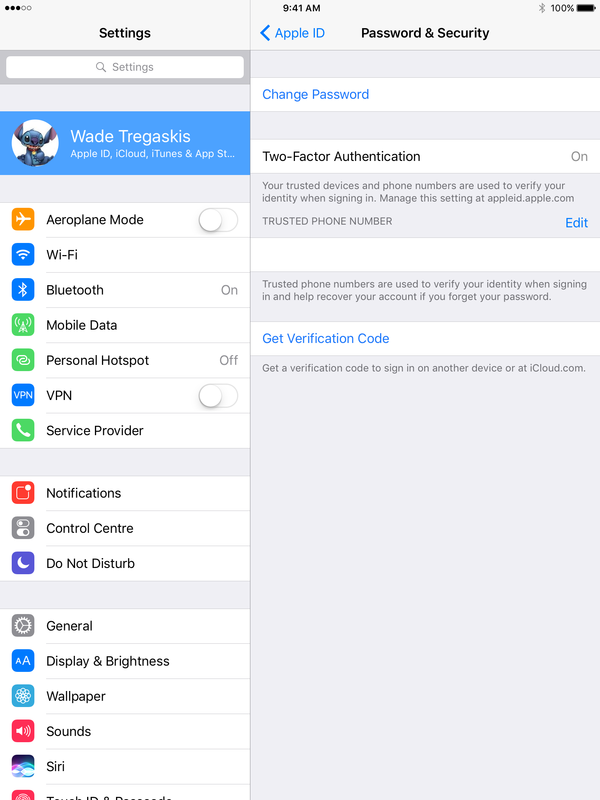 You cannot turn off “two-step” authentication from any of your actual iDevices’ Settings apps. Then, stupidly, you can’t actually enable “two-factor” authentication from that same website. That can only be done in the Settings app on one of your iDevices – by (in iOS 10.3 or later) going into Settings ➜ <your name at the top of the list> ➜ Password & Security. There’s no way to enable “two-step” authentication anymore. And not having any form of two-factor authentication enabled is a very bad idea. So if any of your family’s accounts have “two-factor” authentication enabled, you basically have to switch to “two-factor” on all of them. Which would be broadly fine, if Apple hadn’t made it so needlessly complicated, and the two systems so incompatible that their own software can’t figure out what’s going on. Author Wade TregaskisPosted on April 15, 2017 Categories RamblingsTags Apple, AppleID, authentication, Broken by design, Family Sharing, iOS, iPad, Snafu, Two-factor, Two-step, Undocumented, What do you want?